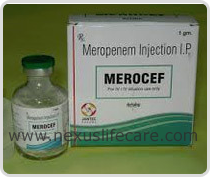 Uses:- Meronem Injection is used to treat a wide variety of bacterial infections. Meronem Injection is known as a carbapenem-type antibiotic. It works by stopping the growth of bacteria. Side Effects:- Swelling, redness, pain, or soreness, headache, nausea, vomiting, constipation, or diarrhea.